Anyone who has had to operate a slider during an interview will realize the value this new slider can add to your projects. Best of all, this tool can replace additional overhead on crew to operate that B-cam while adding high production value dynamic camera movements. 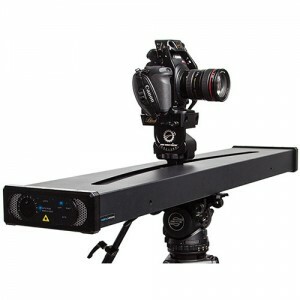 Fully motorized, the new Redrock Micro One Man Crew Motorized Slider offers variable speeds, steady consistent movements, and silent operation. The curved track design allows your subject to remain in frame as the camera tracks back and forth automatically. The new RedRock Micro One Man Crew is available now for pre-order (click here). Posted in DSLR Slider, Video Dolly. Tags: motorized slider, One Man Crew, redrock micro, Video Camera Slider on May 13, 2013 by Emm. @Travis W - I was there at NAB, this booth they were in was a like a fish tank acrylic room. Very small in there, and there were other cameras that were filming the actual show. Hopefully we'll see some better examples once the product is available. @Alex - At NAB the Edelkrone product was only a prototype, so it could still be several months out. We will have to wait and see what pricing is like. For this use I was considering a motorized slider. This one has the curvature as well but it is pretty pricey. But on this one I thought I could hear the noise from the travel in the background. 1500 bucks seems very priced for one feature. Maybe there are other options that can give you more possibilities. Please, check Xlidercam-M, a motorized slider controlled by an Android device via Bluetooth (phone or tablet). I have one and the working environment is very intuitive: one of its dozen features are panoramas maintaining an objective in frame. @Em: What other options out there besides this and the Kessler one that you are aware of? I'm definitely interested in the automated panning feature where an object stays centered. You're right, this Red Rock unit is great and it seems like almost all of these companies are creating products with different strengths and weaknesses, which is good. It means we have competition and innovation and that's great for those of us that use the tools. I'm still using an IGUS slider but thinking of upgrading at some point here to a better system as mine sticks often. @Tim - There is probably a few different options out there that can serve the same purpose, but I think Redrock wanted to just eliminate as many variables as possible making it the fastest possible tool. Some of these high profile interviews only give you a few minutes to setup (cameras, audio, lighting, etc. ), and a few minutes to shoot the interview. These are the situations where this can add big value and convenience. This won't replace every slider, or fit every type of shooter out there, but the idea is great and there's still a big market for something like this. It's too big for my taste. I didn't listen to the entire 12mins (@work), but I'm curious, what legs did they recommend? hmm, I wonder if the new Kessler Parallax vs. this would be better. Parallax seems to be a lot smaller and lighter, but I wonder if the Kessler motors are as quiet. I think when you add together all of the costs, the Kessler solution would be more expensive though, however it seems like you get a more useful slider that you can use for different things where this RedRock Micro unit is pretty specialized.